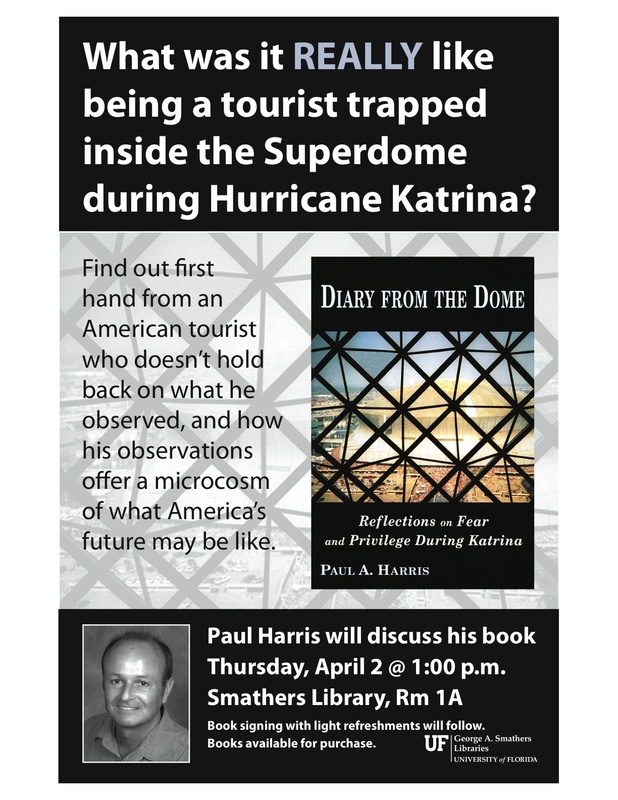 Dr. Molly Barrow will interview Paul Harris on her online radio show. Tune in and feel free to call in any questions. "Nancy's Bookshelf", a very successful radio interview program in Northern California will be having an interview with the author of Diary From the Dome. It was pre-recorded so there is no call-in, but the 30 min. interview moves quickly with Nancy's excellent interview style. You may listen on podcast at KCHO.org. It starts at 4:30PM PST, 6:30PM in NOLA. Saturday, November 7th, 2009 10-6PM Book Signing. New Orleans Bookfair. 500-600 block of Frenchmen Street (NOLA). Drop on by and say hello. Saturday, October 24th Book Signing. Drop by between 4 and 6PM. Tuesday, September 8th 12:00 Noon Hancock County Library - "Authors & Characters Series"
Book talk & signing are free but if you would like lunch please contact the Library at 228-467-5282 to make a lunch reservation.